The INFICON SHARK Vacuum Pump is designed for the Service Professional for quick deep evacuation, simplified maintenance/repair, and durability. 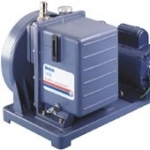 SHARK is a two-stage rotary vane pump, with 6 cfm rated displacement for ultimate vacuum down to 15 microns. The pump, with features such as a large oil capacity, gas ballast, internal oil pump, and fan, allow service technicians to make easier, more efficient service calls. The unique molded design of SHARK allows for easy carrying to the job while giving extraordinary durability. Bill Monahan, President, email, Tel. John Balamuta, Director of Marketing, email, Tel. Jim Dawson, National Sales Manager, email, Tel.